I'm taking another lick at making homemade sugar free ice cream. A few years ago I tried recipe after recipe. Before I found a winner, the low-carb craze made even Breyer's safe for diabetics. 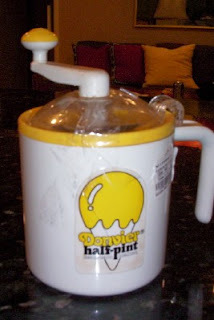 Storebought was cheaper, too--$2.50 a half gallon on sale cost less than cream, Splenda and flavorings at home. *My husband can't overeat the results. *I can switch to natural stevia sweetener instead of Equal or Splenda. I'm always happy to have a homemade alternative, especially if it's better for us to eat. I'll keep you updated on the progress! try making sorbet, also! using berries and stevia and lemon. I saw Giada on Food network making raspberry Italian Gelatto...very rich and satisfying, could be low sugar. I've had gastric bypass and can't have sugar either. We make a high protein shake that makes GREAT ice cream! Add 3 or 4 ice cubes and re-process until smooth. You can then freeze in an ice cream freezer or just have it like it is. You can also use vanilla protein powder and different flavors of pudding mix. (Lemon is one of my favorites!) Oh, leave out the peanut butter on the lemon ones! We freeze strawberries and peaches and use instead of ice cubes in vanilla shakes to make fruit shakes. This is a great way to make strawberry ice cream. YUM!